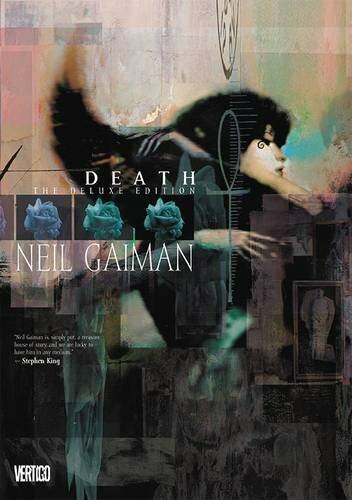 From the pages of Newbery Medal winner Neil Gaiman's THE SANDMAN comes fan-favorite character Death in a new deluxe hardcover edition collecting her solo adventures! The first story introduces the young, pale, perky, and genuinely likable Death. One day in every century, Death walks the Earth to better understand those to whom she will be the final visitor. Today is that day. As a young mortal girl named Didi, Death befriends a teenager and helps a 250-year old homeless woman find her missing heart. What follows is a sincere musing on love, life and (of course) death. In the second story, a rising star of the music world wrestles with revealing her true sexual orientation just as her lover is lured into the realm of Death that Death herself should make an appearance. A practical, honest, and intelligent story that illuminates "the miracle of death." This new hardcover collects the DEATH: THE HIGH COST OF LIVING and DEATH: THE TIME OF YOUR LIFE miniseries, a must have for any fan.